NASA's first flight test of its Ares I-X booster is only slated to lasttwo minutes, but it represents the culmination of years of work by the rocket-minded ATK Space Systems in Utah and almost 1,000 otherNASA workers and private contractors across 17 states. To ensure that they see the fruits of their labor, technicians haveinstalled more than 700 sensors on the $445 million AresI-X test vehicle. That electronic swarm should provide engineers with asmorgasbord of flight data, and has led to a few jokes regarding thesensor-studded rocket. "It's almost like flying a Christmas tree," said TrinaPatterson, a spokesperson for ATK Space Systems, an aerospace company based in Magna,Utah. 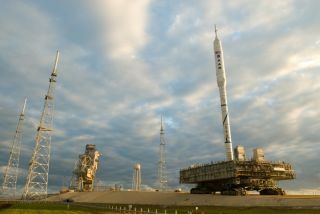 The rocket is set launch at 8 a.m. EDT (1200 GMT) Tuesday from NASA?sKennedy Space Center in Florida. ATK has good reason to want that data, because it produced the firstrocket stage that plays the undeniable starring role in the upcominglaunch. Its story represents just one out of many involved in the U.S.space agency's first small step back to the moon with its tallest rocket ? the 327-foot(100-meter) Ares I-X ? in more than 30 years. ATK drew partly upon heritage technology and lessons from the shuttleera, based on a history of making solid rocket boosters for the space shuttleprogram. It also placed safety first following the fallout from the 2003 shuttleColumbia tragedy ? speed of production and cost still came in second. "We have balanced all of those things to the point where safety wasalways the deciding factor," said former NASA astronaut Charlie Precourt, vicepresident and general manager of ATK Space Launch Systems. Four of the five segments in the first stage represent would-be shuttleboosters dating back from when the Columbia disaster put a temporary stop onshuttle flights. NASA shipped the segments back to Utah, where they sat unusedand exceeded their technical shelf life of five years. But ATK ran tests on the segments and found them still remarkablyhealthy. Managers eventually decided to give them new life as partof Ares I-X. Engineers made the first stage design with simplicity as a guidingphilosophy and were rewarded when the initial ground firing tests only turnedup two minor glitches directly related to the rocket. They modified thesegments, reshaped the propellant mold, and adjusted the nozzle area to allowfor more power. ATK also produced three giant parachutes that will help bring the firststage back down to Earth. Tests with single and triple parachute drops from AirForce C-17 cargo planes at Yuma Air Base in Arizona all went smoothly. Precourt recalled that some senior ATK employees familiar with theshuttle program hesitated at first when Ares came onto the drawing board. But nowthey want to do it again. "They've been pulling all-nighters, and working odd days and weekends,"Precourt told SPACE.com. "You don't have to twist their arm to doit." Upon completion, the lower stage segments shipped out as pieces of theoverall Ares I-X project. Segments rode insulated rail cars all the way fromATK's facility in Utah to the launch site at Cape Canaveral in Florida ? a seven-dayreenactment of earlier journeys taken by shuttle booster rockets. The upper stage simulator also underwent its own odyssey about a yearago. NASA?s Glenn Research Center produced the mock-up in 11 pieces in-houseusing its machine workshop, a point of pride for NASA's civil servants. "I've waited about my entire career for an in-house project,"said Vince Bilardo, NASA Glenn project manager for the Ares I-X upper stagesimulator. Each upper stage segment rode a truck semi-trailer from Cleveland, Ohio,to a port on the Ohio River. There they offloaded onto a special mega movership called Delta Mariner, and made a 12-day journey down the Ohio River to theMississippi River, before finally crossing the Gulf of Mexico to Florida. The Orion spacecraft and abort system mockups for Ares I-X flew to theCape aboard a C-5 cargo plane from Langley, Virginia. Even assembling all the rocket components at NASA's Kennedy Space Centerproved a challenge, because ongoingshuttle flights still use the onsite facilities. That meant the Ares I-X workerscould not modify too much equipment to suit their needs. "We had to come up with a way to put the pieces together, knowingthere wasn't external access to platforms and scaffolding in the facilities,"said Scott Graham, chief of the launch systems project office at NASA Glenn. The solution involved internal ladders and platforms, so that technicianscould stand inside each upper stage rocket segment and bolt them together. The sensor data from the assembled "Christmas tree" willrepresent the ultimate payoff from the Ares I-X test for the engineers andtechnicians involved. But some remain wistful, because there are no plans torecover the upper stage of the rocket or the Orion capsule. "Our hardware that's been so near and dear to our hearts will endup on the bottom of the Atlantic," Graham said, speaking for the NASAGlenn team. Sentiment aside, a smooth launch can do much morethan just provide a lode of test data for finalizing the design of Ares, mission managers have said. It mayalso help inaugurate the dawn of a newera for U.S. space exploration, pending an ongoing presidential review. SPACE.com will provide full coverage of NASA's Ares I-X testflight with Staff Writer Clara Moskowitz in Cape Canaveral, Fla., and ManagingEditor Tariq Malik in New York. Click herefor live launch coverage and mission coverage. Live updates begin Tuesday at 5a.m. EDT (0900 GMT).